Cleanliness varies among gyms and is an important factor in deciding whether or not to become a member. How clean and sanitary a gym remains is also important to members when they need to decide if they will renew. Proper gym etiquette means wiping down equipment after it’s been, and some people go the extra mile, even wiping gym equipment clean first. However, a typical hand wipe for personal use is not enough to kill and remove harmful germs. Only anti-bacterial disinfectant wipes are designed for use on surfaces like gym benches, hand bars, and even weights themselves. We recommend using FDA approved wipes only. A key area to clean is the running and elliptical machine area. Almost every gym is equipped with these high-demand machines, and they are often the first place members go to work out. With lengthy time spent on these machines, a lot of germs can be transmitted from hand bars and digital displays to the next user if not effectively cleaned. To keep members safe and healthy, all running/walking machines should be wiped down with FDA approved disinfecting surface wipes to help prevent the spread of Staph, MRSA and HIV-1(associated with AIDS), HBV (Hepatitis B Virus), and HCV (Hepatitis C Virus). 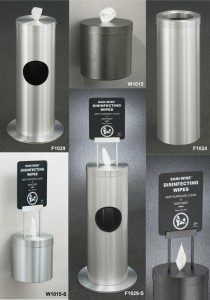 Manufacturers of wipes dispensers offer both floor standing and wall mounted products. Sanitizing wipes should be used in a gym’s weight lifting section, including free weight areas and weight lifting machines and nearby floor mats and benches. Having the wet wipes conveniently and strategically located near this area is the key factor in promoting their use. Especially in busy gyms, when there are lines and wait times for weights, it’s important to have easy access for gym members to promptly wipe and clean equipment before moving on to another area. Exercise, yoga and stretching mats are often a destination for gym members before, during and after a workout. Germs can spread and collect on mats, which will harbor harmful bacteria and lead to cross contamination if not cleaned. While many members bring their own mats for Yoga, areas where members tend to stretch are common areas with public mats that are heavily used. In addition, gym balls (inflatable exercise balls) roll around on the floor and make contact with many areas of the body. They are also not usually cleaned because they are large and difficult to manage. In sum, whether you are a small gym in a condo complex or a franchise such as Equinox, Gold’s Gym, Planet Fitness, Retro Fitness, Snap Fitness, and World Gym, using wipes designed for use on surfaces can help your business and its membership flourish. Little extras such as supplying clean towels to members will not only improve service but will help discourage members from reusing towels that are not clean. But don’t forget that keeping people clean means keeping surfaces clean first!